He says it reminds him of Freddy Krueger, he of A Nightmare on Elm Street fame. Freddy is so frightfully ugly, I don’t even want to put a picture of him in this post. In stead, here is a link to the Google image search for him. Go have a look (quickly! ), then come back to the blog and read on. 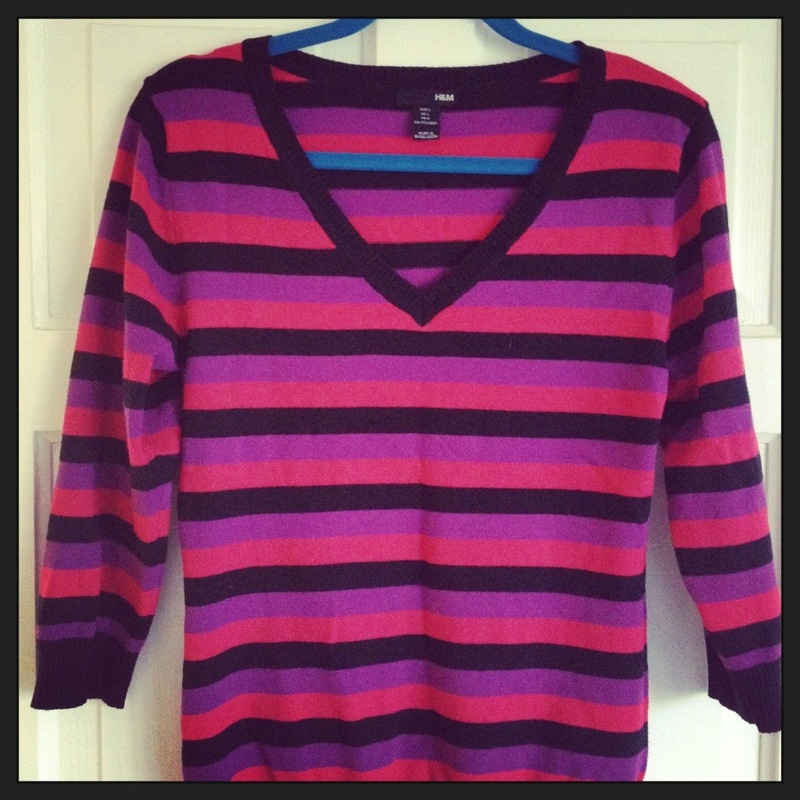 Did you see the resemblance between Freddy’s red & black striped sweater and my pink, purple & black striped sweater? I don’t think mine screams Freddy Krueger, but I guess the black horizontal stripes and pinkish-red is close enough to bring back memories of watching the horror film. Knowing my husband, he probably watched A Nightmare on Elm Street when he was way too young and was scared sh*tless – hence visions of Freddy Krueger when his wife is wearing a sweater with black horizontal stripes. No matter what the reasons for his Sweater Aversion, if I want to wear my sweater when out & about with him, I need to find a way to de-Freddy it. 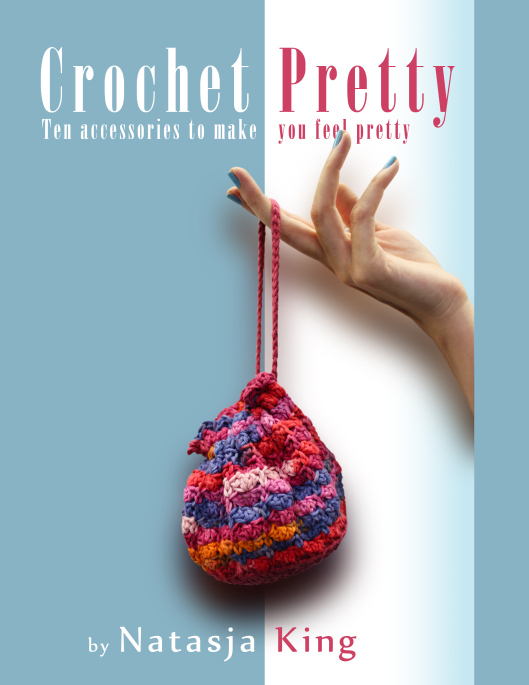 Enter Simply Crochet magazine Issue 2. It dropped through our front door on Saturday (yeah!!!). 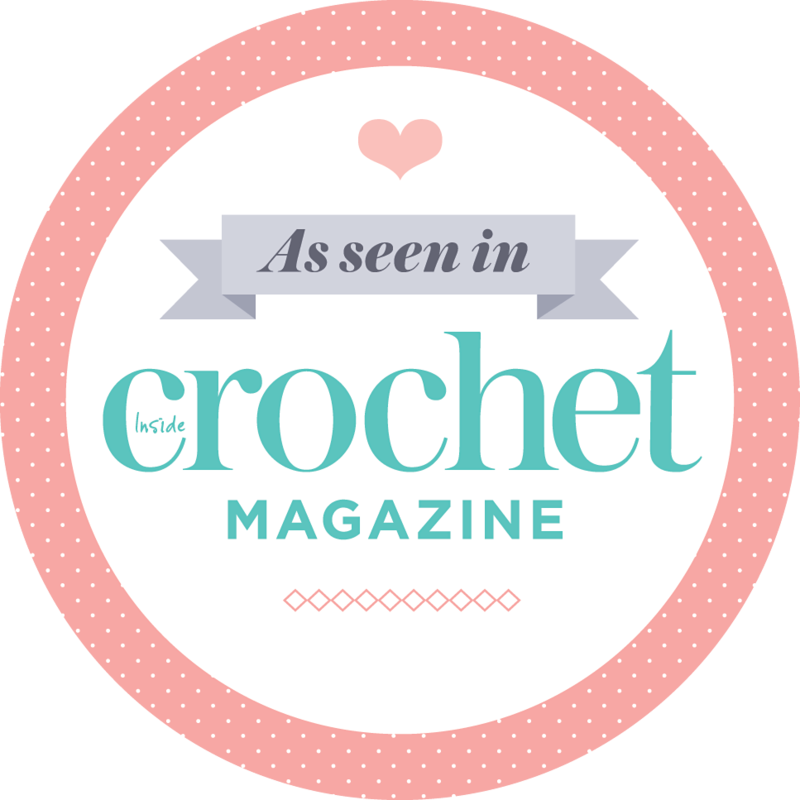 Just like Issue 1, it’s jam-packed with crochet projects, one of which is a crochet pocket patch. When I saw it, I just knew it’s the perfect adornment to de-Freddy my sweater. I whipped it up in ten minutes using a 3 mm crochet hook and black Elle Family Knit 4-ply yarn, and sewed it onto the sweater with invisible thread. Seeing as I used a 4-ply yarn, and not DK as in the pattern, my pocket patch came out smaller, but it’s perfectly proportioned for my sweater. When Hubby saw the sweater he was very impressed and said it “looked great”. He even agreed to be seen with me wearing it! 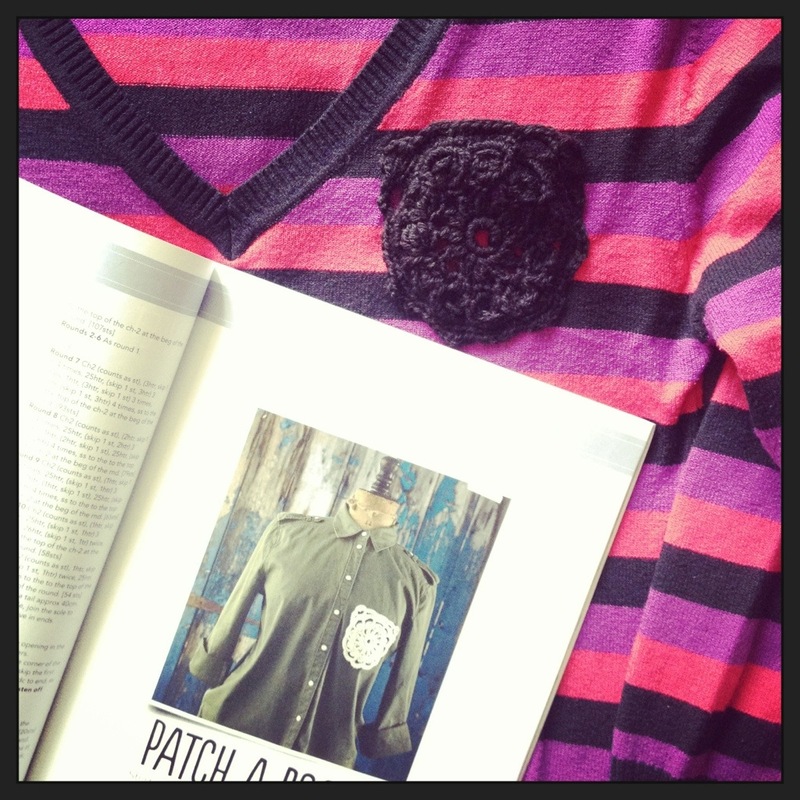 Freddy Krueger 0 – Crochet 1. Result! Lol! Sounds like something Mr P might say. They are so tactful aren’t they? Good job we love them lol! Men! No fashion sense at all. 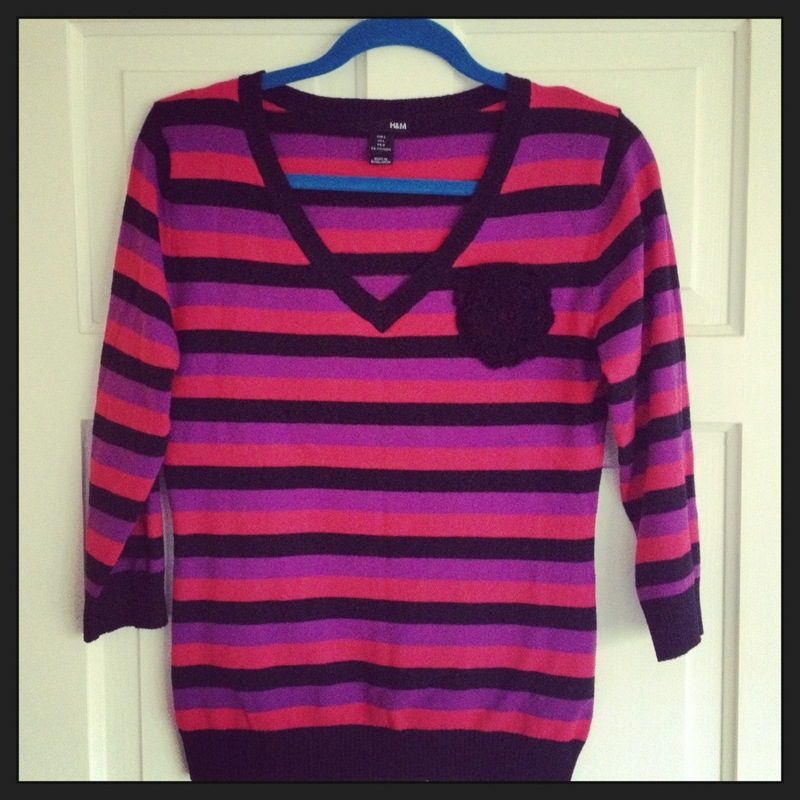 I like the sweater without the pocket, but you did a great job of changing it to make your sweetie happy. What a fantastic outcome…:-) , just goes to show, there is nothing that a creative mind and a bit of crochet can fix. Dit is die oulikste storie. John, ek stem saam met jou. Dink egter sy met die hekelpen, sy het haar pen die strepe laat les opsê.